Hydrocotyle tripartita 'Japan' is a variant of Hydrocotyle tripartita from South-East Asia. This small, delicate Hydrocotyle is highly popular with aquascapers especially from Asia, and is known under diverse names there. It is characterised by fast, compact growth and small, intense green leaves on vertical stems. 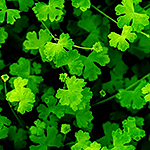 The plant is carpet-forming (5-10 cm tall) and its compact growth can be promoted by physically pressing the carpet with your hand when maintaining your aquarium. Under lots of light and CO2 as well as an ample supply of nutrients it grows very fast and may even tend to get invasisve. Under lower lights it grows more slowly, and its sprouts have a more upright than creeping growth habit. You will get plant with 15-20 nods.